The Nextel Cup Series has Daytona. The IRL-style cars have Indianapolis. Even Sprint Car fanatics know they have Knoxville. These are the grand-daddy tracks laden with history for each division of racing. Now the NASCAR Modified Gang has their “Great American Race” back on its schedule. 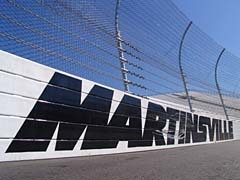 The “Big Dance” for the Mods at Martinsville Speedway returns Labor Day weekend, Saturday night, September 3rd. But this dance has been given a little extra pizzazz. First, it will be the inaugural race pitting the Whelen Modified Tour (from the North) against the newly formed NASCAR Southern Modified Tour. And the icing on the cake is that the race will take place under the lights at the historic half-mile speedway. 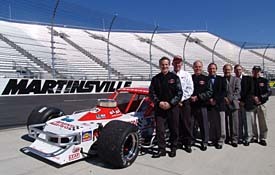 Modifieds and Martinsville, two words synonymous with each other for more than five decades, are back together once again. Years ago, the Northern folk would mark the date on their calendars months before even packing to make the trek down south. Southerners would await the arrival of the Northern contingent, anxious to defend their turf. Once both groups hit the track, the battle was for pride in who hit that coveted checkered flag first. “This is NASCAR’s first division so it’s perfect that we are the ones to run under the lights first at Martinsville,” said defending and four-time NASCAR Modified Tour champion Tony Hirschman. “With the way the lights reflect, it makes the cars looks faster. It will be exciting. That history began on September 7, 1947 when Red Byron won the very first race ever held at Martinsville Speedway; a 50-lap Modified show in front of 6,013 fans. From there, many Modified greats put the pedal to the medal on the concrete of this Virginia speedplant; names like Evans, Bodine, Hendrick, DeSarro, Stevens, Jarzombek, Sacks and Stefanik. But Jerry Cook is one if the Mods all-time winner there, with seven trips to Martinsville’s elusive victory lane. And it was home for the Modifieds too until 2002 when LW Miller won what many thought would be the final Mod show at the historic track. That’s why there was not a face without a grin from ear-to-ear when it was announced Wednesday at Martinsville that the Whelen Modified Tour (from up north) and the newly formed Southern Modified Tour would combine for a two-day event. down here and six or eight people would stay there for three, four days. It’s part of those rites of passages we always talk about. 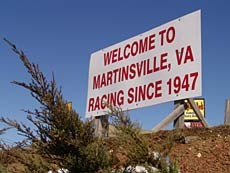 I remember the first time I was able to go to a bar once I grew up was here in Martinsville. Part of the hype surrounding the event is the fact that it will pit the best in the northern modified world against the boys from the south. LW Miller, who has won the last two Modified titles in the south, may have won the last race at the track for the division, but his roots are firmly entrenched in the north. “Satch” Worley is actually noted as giving the south its final victory at Martinsville in 1992, but even he was driving the Bob Garbarino northern Modified. And “Satch” had been competing on the northern tour at that point in his career. Even Junior Miller will tell you, the last true southern boy to win at Martinsville was Johnny Bryant in 1985, in a machine prepared by David Riggs, who ironically prepares Junior’s cars now. 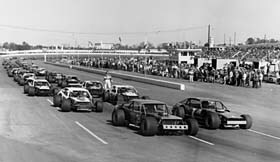 The Mods lined up for one of their shows at Martinsville in the late-70s. Look closely and you can see the NASCAR Grand National cars on pit road as well. The past two years, the independent group C&C Race Promotions promoted its own version of the North vs. South Shootout with much success. That event is still on for this year (at Concord Motorsport Park on Nov 4th & 5th) and NASCAR insists they are not trying squash that race. 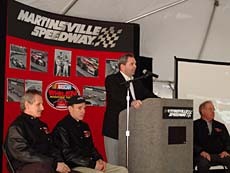 Nevertheless, this event, after all, is at Martinsville, a place entrenched with Modified history.